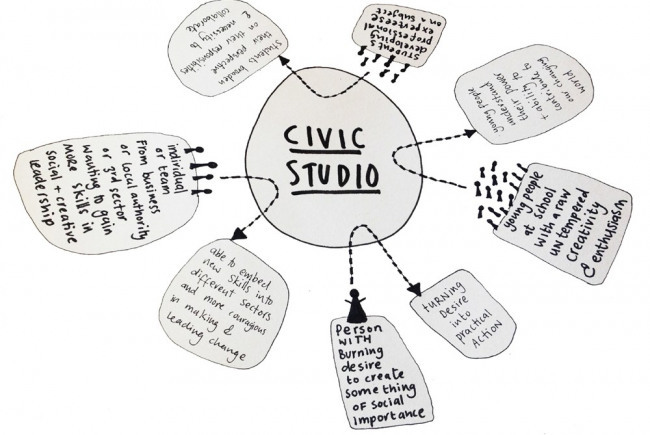 Civic Studio will be a working and learning space in Southwark for people with the desire to turn their ideas into positive social change. ...People learn by doing. We will provide classes for people of all ages and backgrounds that share skills and knowledge from design, science and digital technology to help them turn their aspirations into action. ...People have a space to think. We will create an inviting, accessible workspace for people to come together, talk about their work, get some advice and support, and have time to research and learn from others. ...Great work is born. We will lead by example and use the space to make and test ideas we believe will tackle the important social issues in the area, while linking into the objectives of Southwark Council and other local partners. Hold weekly events to introduce local people to the different possibilities of making a social difference. Transform a vacant space on the Walworth Road into an open learning and working environment. Offer weekly classes across design, science and digital technology to allow people to learn new skills and knowledge. Provide a flexible, shared workspace where people can meet and develop ideas around common interests. Support or start new initiatives to tackle social issues in collaboration with Southwark Council and local partners. We share the Mayor's vision that high streets should be places where local groups and organisations have the opportunity to try new ideas. A lot of people in the area have the potential to create great things but lack the knowledge and support to make them happen. We aim to help anyone overcome these barriers and turn their good intentions into action, leading to higher individual aspirations and more local initiatives. Everyone should have the opportunity to learn by doing but traditional education is inaccessible and detached from reality. We aim to make learning more open, agile and ideas-led, leading to an increase in the number of people receiving support that helps them progress in life. Breakthroughs happen when professions collide but these opportunities are rare due to barriers of communication. We aim to bring people, businesses and local authorities together around common interests, leading to more strategic links between their objectives and our work. Decorate, remodel and furnish the space so it is welcoming, vibrant and fit for purpose. Open our doors to the public and promote our classes and events in the local area. Use the feedback to focus our own initiatives and build practical links with local organisations. Identify and secure a six month starter lease for an appropriate space on the Walworth Road. Listen to the types of issues, intentions and ideas that people come with to grow what we do. Only people will change the world. We believe the high street should be a place where people from different cultural, economic and educational backgrounds come together and feel able to make a positive social change in their area. It shouldn't always be the same people giving it a go. We want to engage people who would not ordinarily rub up against social innovation practice. We are confident we can turn the high street into a place where learning, creative thinking, making and connecting can happen more fluidly across different sets of people. This is a partnership initiative between Ella Britton from the Design Council and Edward Gardiner from Warwick Business School. 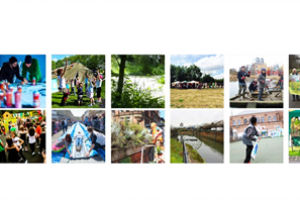 We worked together on the design and delivery of the Knee High Design Challenge and as part of the legacy of that programme want to continue to share with the communities in Southwark how possible it is to make positive social change. We want to bring together design-thinking and behavioural science to create programmes of learning that will inspire and enable more people in Southwark to make positive social change. We would love the opportunity to create this space in a hyper local way, and with the support of both the Design Council and Warwick Business School, we feel we could make it a success. Project Delivery Manager: Civic Studio The Project Delivery Manager takes legal responsibility for receiving and spending the funds raised and ensuring the project is delivered.